The Bermuda Underwater Exploration Institute and Nonsuch Expeditions will present a talk entitled “CahowSeason 2019” with Jeremy Madeiros and international researchers on Monday, February 11th. 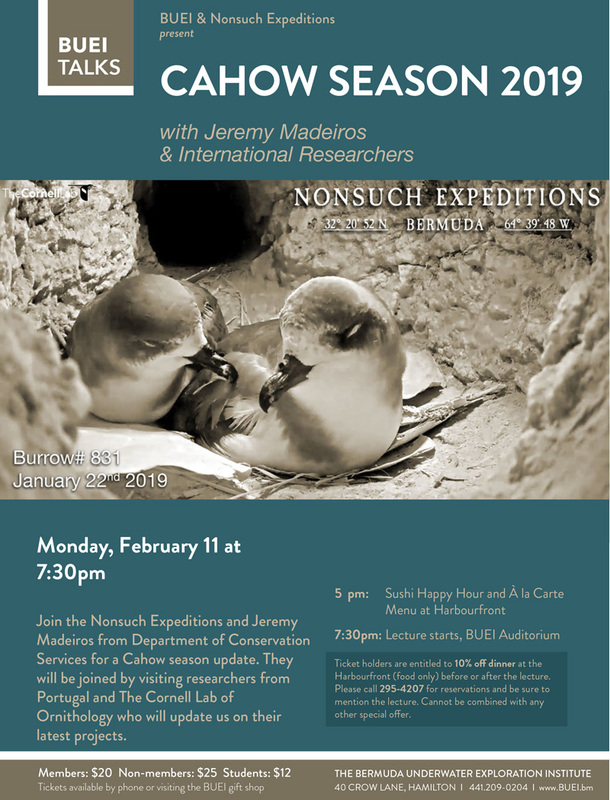 The event poster says, “Join the Nonsuch Expeditions and Jeremy Madeiros from Department of Conservation Services for a cahow season update. They will be joined by visiting researchers from Portugal and The Cornell Lab of Ornithology who will update us on their latest projects. The presentation will get underway at 7.30pm at BUEI Auditorium, with a Sushi Happy Hour and A la Carte Menu to be held at Harbourfront at 5.00pm. Tickets cost $20 for members, $25 for non-members and $12 for students, and are available by calling 441-209-0204 or visiting BUEI’s Oceans Gift Shop.